The BYU Management Society has selected Paul Gustavson and Stewart Liff to be keynote speakers at The 2014 Management Society Leadership Conference on October 3rd to discuss the concepts of their most recent book, "A Team of Leaders". New York, NY (1888PressRelease) August 26, 2014 - Imagine having a team where everyone steps up and performs all of the leadership tasks. Imagine a team that is constantly sharing knowledge and pushing the envelope-one that produces outstanding performance and plans for the long term future. On October 3rd, authors and speakers Paul Gustavson and Stewart Liff will be discussing their new book entitled, "A Team of Leaders: Empowering Every Member to Take Ownership, Demonstrate Initiative, and Deliver Results" at the 2014 BYU Management Society Leadership Conference. Their lessons have applications for leadership teams at all levels. Gustavson and Liff state "…unless employee engagement flows from your overall work design and supporting systems and processes, you will constantly struggle with performance and engagement issues." Paul Gustavson and Stewart Liff will share how work design systems and visuals are key components to solving employee disengagement and improving team results. Paul Gustavson is a notable author, consultant, speaker and board member. He has extensive experience in studying the dynamics of highly effective teams. Gustavson has devoted his career to creating work environments in which workers are able to thrive, with an emphasis on ideas and strategies to build better homes, places of businesses and communities. He is the 1994 recipient of the Marriott School of Management's William G. Dyer Distinguished Alumni Award, as well as the 2004 recipient of the Herrmann International Big Thinker Award. Stewart Liff is an award-winning human resource executive, author, advisor, teacher, and artist. Stewart is one of the world's foremost proponents of using visual displays to connect employees to their mission and for sharing performance information with the workforce. He started Stewart Liff & Associates, Inc. to share his unique approach to performance management, help organizations design and implement Human Resource Management (HRM) programs, and develop high-performing self-managed teams. A Team of Leaders has been selected by Soundview Executive Book Summaries as one of 2014's best books on business practices. It was also recently selected as the Leadership Book of the Month by The Washington Post. 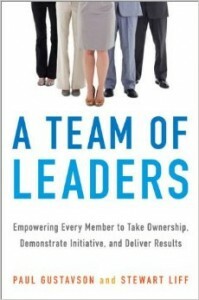 For information about "A Team of Leaders" visit www.ateamofleaders.com. Visitors can also take the A Team of Leaders online assessment and receive a free leadership report to determine their team's level of efficiency and effectiveness. The site's blog is regularly updated and covers topics such as how the government can benefit from effective teams, how to maintain organizational health by fostering team participation, and transforming lessons from sports teams into business leadership.